Program now supports Mac OS 10.5 Leopard and Windows Vista OS. Program has to be updated to ver. 9.5 for using on Mac OS 10.5. Versions older than 9.3 do not support Mac OS 10.5. AtoZ image data can be displayed at anytime by using image layout function. All data can be searched by patient name or number. Up to 3 different types of data view are available including view in chronological order. Display speed is high in any option chosen. By double-clicking an image it will be shown in full screen. Press "Control + click" to move back to AtoZ analysis. Different settings are available for a reference folder. You can create a folder for each patient and combine them in a group for further reference or save all data in one folder. When A2Z data folder is chosen, all included subfolders will be displayed. You can move or add AtoZ data or sub-folders at any time. 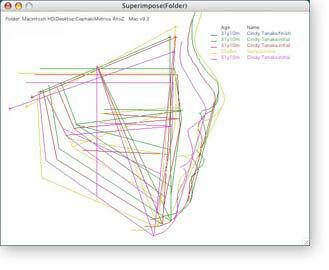 The screen image of new polygon table or facial diagram of analysed data now can be exported to JPEG file. When "Bimler trace inversion" option is checked for Bimler analysis, the trace will be automatically inverted from right to left. New cross line and parallel line tools were added to the trace window. In case with the cross line tool, by clicking 2 optional points you can create vertically intersecting line between them. In case with the parallel line tool, for any optional segment AB you can create a parallel line passing through point C.
Patient data files now can be accessed more easily. Simply point an arrow on the patient picture you want to open and click on mouse pressing the Control key. Data will be displayed in the patient window. This method makes opening data files more simple. In new version of the program, patient data can be shared on both Windows and Macintosh systems, even on a network. It was not very convenient to input lateral or hard tissue lines with mouse-dragging, so we made an improvement and from this version line input is performed simply by clicking on points (a smooth beige curve will be shown). You can switch a line input between this new and the old one. "Superimpose (Folder)..." option from "File" menu is now interlocked with trace display settings. Superimpose of more than 4 facial diagrams etc can now be displayed. A trace line pattern now can be chosen, in addition to traditional line thickness and color. solid, dashed or wavy line can be set. 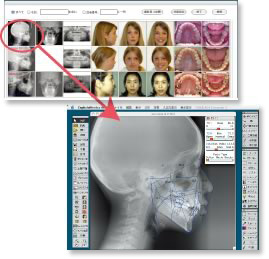 Facial diagrams or superimposes can be easily compared now. 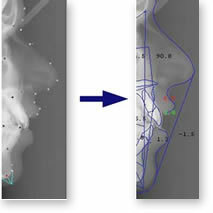 When inputting a model, width of blue/red/green points can be displayed by clicking mesial or distal. By pressing Shift key and clicking you can move back to a previous point. 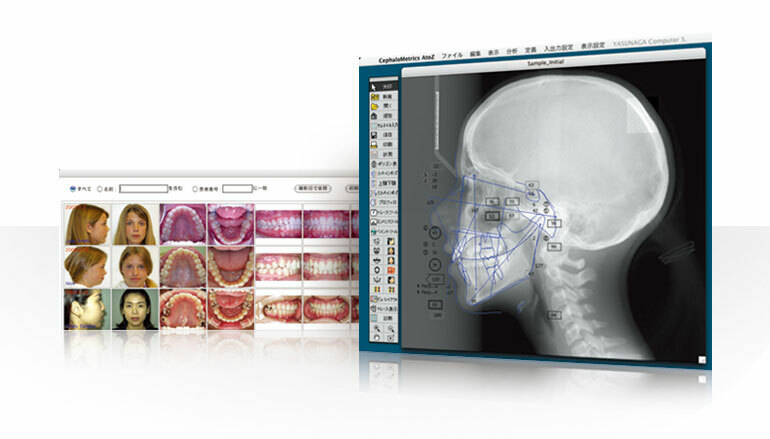 Display of dental arch width/length for lower and upper jaw in model polygon display mode has been added. These values are inputted manually through "Tooth size..." analysis menu after being measured with slide caliper (like BAW and BAL etc). About "Little Irregularity Index": Sum of inter-canine distances is required. Yasunaga Computer Systems Co., Inc. Copyright(C) 2008 -2016,YASUNAGA Computer Systems Co.,Inc.